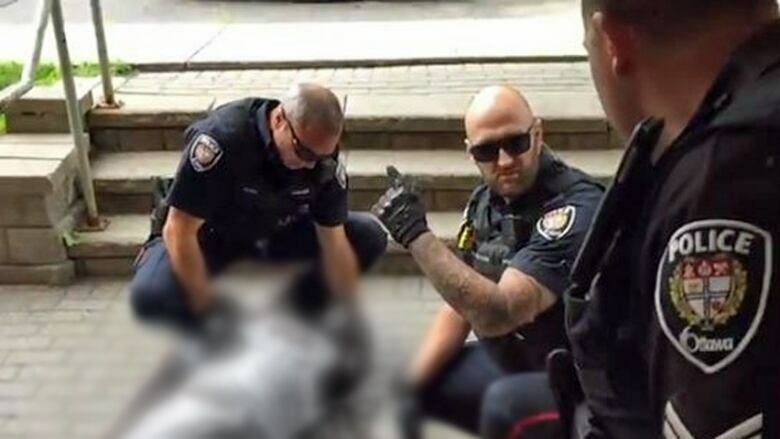 Members of the Ottawa Police Service and their supporters have purchased hundreds of wristbands showing solidarity with Daniel Montsion, the officer charged with manslaughter in the death of Abdirahman Abdi last July. Members of the Ottawa Police Service and their supporters have purchased hundreds of wristbands showing solidarity with Const. Daniel Montsion, the officer charged with manslaughter in the death of Abdirahman Abdi last July. CBC News has learned some 1,200 of the black and blue, silicone wristbands have been purchased, bearing the words "united we stand" on the outside and "divided we fall" on the inside, along with Montsion's badge number — 1998. The bands were ordered by officers and have been sold for $2 each. They were advertised on a Facebook site accessible only to members, under the heading: "In support of Cst Dan Montsion." "It's well-supported, that's for sure," said Ottawa Police Association president Matt Skof. "This is just about expressing their support for a colleague. It's a very difficult environment that we're in, in policing." Noting that Montsion's legal costs are already covered by the police association, the Facebook post states all profits from the sale of the bracelets will go to a police benevolent fund. The show of support is raising concerns both inside and outside the force, however. A police officer who spoke to the CBC on the condition of anonymity said he won't wear the bracelet, and said other officers won't, either. "I think it hurts the integrity of the service," the officer said. "It's taking sides." Ketcia Peters, co-chair of Ottawa's Community and Police Action Committee (COMPAC), said she met Tuesday with members of the police service to express her concern over the bracelets. "Think of how the Abdi family will feel, knowing this. What kind of message does it send?" Peters asked. Peters said while she can understand the desire of some officers to show solidarity, she fears the community — particularly Ottawa's black community — will be deeply offended by the message the bracelets are sending while the death of Abdi, a Somali-Canadian, is under investigation. "It's going to set us back, in terms of trust and the relationship-building that we've been working on over the past year. It's going set us back. Aisha Sherazi, another member of COMPAC, also had concerns. "I think it's in bad taste that police are presenting themselves as judge and jury before a court case is over," Sherazi said. "They wouldn't do that for any other member of the public, and they shouldn't do that for themselves." Skof said the bracelets merely represent solidarity with a fellow officer going through a difficult time, and nothing more. "This has nothing to do with the relations we have with the community. This has nothing to do with race. This is not a public campaign. It's a member-driven initiative, an internal initiative for expressing support for a fellow colleague, in a very difficult profession going through a very difficult time." Earlier this month, Ontario's police watchdog charged Montsion with manslaughter, aggravated assault and assault with a weapon in Abdi's death. Abdi, 37, lost vital signs during a confrontation with Montsion and Const. Dave Weir on Sunday, July 24, 2016. He was pronounced dead in hospital the following afternoon. Montsion had a court appearance in Ottawa Wednesday and his case was remanded until May. The 36-year-old had been on desk duty throughout the investigation and is now suspended with pay. The SIU investigates cases of death, serious injury or sexual assault involving police in the province. A previous version of this story stated that the Ottawa Police Association ordered and distributed the wristbands. In fact, the wristbands were ordered by officers themselves.